Energy innovation is thriving in the Upstate. Manufacturers are creating products ranging from meters that analyze energy consumption to massive gas turbines. And although various forms of renewable energy have made some progress in the Upstate, that advancement has been incremental. While the cost of solar power is falling and some states are seeing significant investment in the sector, South Carolina lags. Clemson University solar expert Rajendra Singh believes the development of solar energy in the Upstate is hindered by state policies that favor nuclear power generation. Current state policies will keep solar progress slow in South Carolina, Singh believes. Until that changes, there won’t be a proliferation of solar farms or grid-tied rooftop solar installations in the Upstate. Utilities are deploying innovations they say will improve services. Duke Energy, in an effort to have a “higher level of engagement” with its customers, has been working since late last summer to deploy AMI (advanced metering infrastructure) meters across its South Carolina service area, which includes much of the Upstate. Often referred to as “smart meters,” these devices allow the utility to keep better track of outages. “We are able to communicate to the customer within three to five minutes that we are aware of that outage,” says Joe Thomas, Duke Energy’s director of enhanced basic services. Thomas says Duke hopes to pilot another aspect of the smart meter technology either late this year or early next. This enhancement, which is optional for customers, would provide real-time feedback to customers on energy consumption. There is an Upstate connection to the AMI meters that Duke uses. They are made in Oconee County, by Itron, a company that specializes in technology that measures, manages and analyzes energy and water. In May, the Washington State-headquartered company announced it was investing $8 million and adding 100 jobs at its Oconee facility in West Union. Greenville is home to the largest gas turbine manufacturing plant in the world. 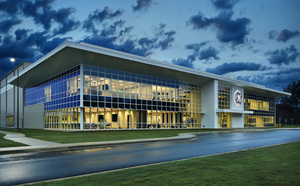 GE Power’s campus employs approximately 3,000. John Lammas, GE Power’s vice president for power generation engineering, oversees the development of a new generation of super-efficient gas turbines. The HA (H stands for the class and A is for a-cooled) turbines are becoming larger and more efficient. The turbines are primarily used by utilities for power generation. The machines produced in Greenville are shipped to customers around the globe. Demand is brisk. As of April, the company had firm orders for more than 60 of the massive machines. “We continue to improve the combustion system,” Lammas says. “Emission is a big deal and we want to get the lowest emission possible. Lammas says GE is using the tests in Greenville to evaluate next generation technologies that will go into future machines. These include materials technology, thermal barrier coatings and lots of cooling technologies. GE’s Advanced Manufacturing Works facility, which opened at the Greenville campus early last year, has provided the company capabilities to push gas turbine technology, he says. Looking ahead in the realm of renewables, Clemson’s Singh asserts that South Carolina’s economic future can be greatly enhanced by improved renewable energy policies. Educating policy makers, as well as the public, will be the greatest challenge.